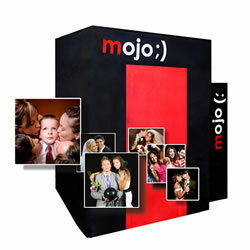 We now offer the Giant Mojo Photo Booth. This booth can take pictures of groups of up to 10 at a time, although as many as 20 have been included before. This photo booth adds a new dimension of value and fun to any event. Weddings, Corporate Events, Birthday/Holiday Parties, Homecoming/Prom, Bar/Bat Mitzvahs and more! Booth rental comes with one of our top technicians working the booth for the entire time of your event to make sure the booth is running 100% properly at all times. Our technicians will always come dressed properly to blend right in with your event.